Alles Gold, was glänzt: Am Stand von Märklin in Halle 4 können die Besucher eine vergoldetet Lok bestaunen. Im wahrsten Sinne hoch her geht es in Halle 3. Neben Ausstellungen verschiedenster Flugmodelle finden durchgehend Flugvorführungen aller Art statt. Am Messewochenende findet in Halle 2 die Deutsche Meisterschaft im Maßstab 1:12. Der Renn-Nachwuchs kann in Halle 3 am Stand des DMC trainieren. In den Hallen 4 und 7 gibt es zahlreiche Schauanlagen zu sehen – Darunter auch mehr als ein Dutzend Deutschlandpremieren. Hier wird es laut: Im Innenhof zwischen Halle 4 und 7 findet erstmalig auf der INTERMODELLBAU ein Meisterschaft im Mikropulling statt. Vielfältige Schiffsmodelle in allen Größen gibt es in Halle 5 zu sehen – auch in Aktion im über 500 Quadratmeter großen Wasserbecken. In Halle 5 können die Besucher auch entdecken, was im Kartonmodellbau alles möglich ist. Einmal einsteigen: Bei den Dampfmodellbaufreunden in Halle 8 können Groß wie Klein mitten durch eine eigens für die Messe kreierte Modellbaulandschaft fahren. Die Interessengemeinschaft Modellgiganten zeigt in Halle 8 in stündlichen Vorführungen ihre große Auswahl an Modellen im Maßstab 1:8. 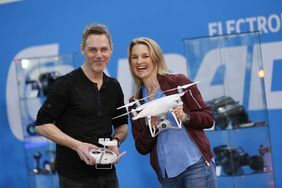 In Halle 3 finden Besucher auch zahlreiche Drohnenmodelle. 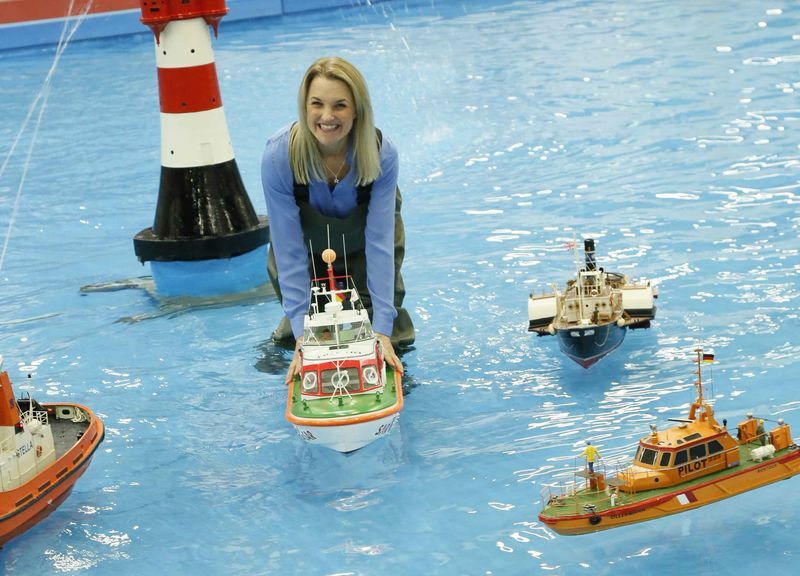 From 4 to 7 April 2019, hobbyists, experts in modelmaking and fans of model ships, model railways, aircrafts, vehicles and figures of all possible miniature sizes come together. 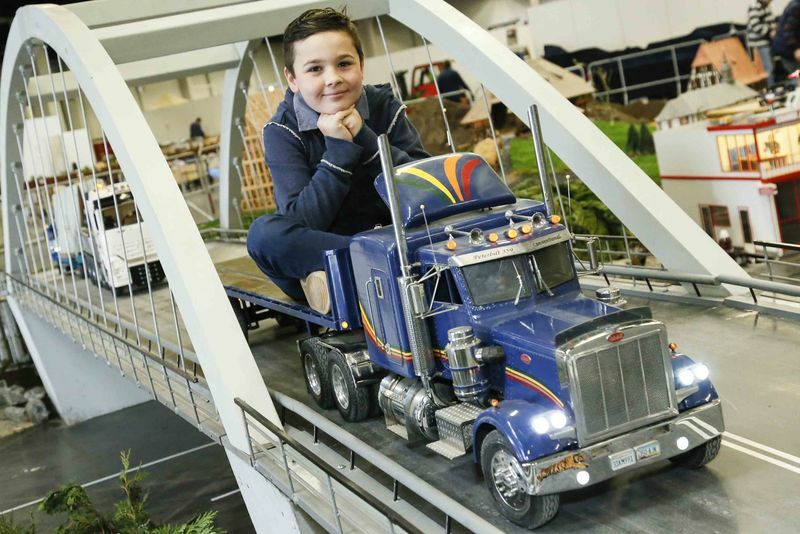 For the 41st time, more than 500 international exhibitors from around the world participate and present the fascination of modelmaking in eight halls at Messe Dortmund. In addition to a wide range of models, presentations and hands-on activities on water, rails, in the air and streets, the robot combat of the Mad Metal Machines also has a comeback. Furthermore, the championship in micro pulling is held at the exhibition for the first time. With its varied programme and a large selection of products from all over the world, INTERMODELLBAU is an interesting event for the young and the old, the entire family and experienced model makers. 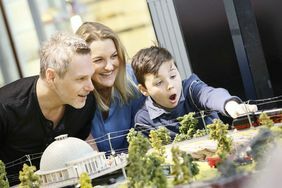 At the world’s largest exhibition for modelmaking and model sport 2019, exhibitors from 18 countries present impressive and detailed products and models as well as the latest technology and trends, give advice on modelmaking or model sport and inspire the audience with exciting battles and daring presentations, races and hands-on activities. In addition to numerous exhibitors from Germany and almost all neighbouring countries, exhibitors from Great Britain, Poland, Italy and Hungary as well as Russia, South Korea and Hong Kong attend INTERMODELLBAU – this is a foreign proportion of 16 per cent. Clear the ring! The robot combat of the German Roboteers Association e.V. takes place at INTERMODELLBAU for the third time. When the Mad Metal Machines of different weight classes meet in hall 1, it is time for a battle of the high-tech gladiators. Axes, high-pressure knock down mechanics or even spinners – destructive rotation discs – are used to immobilise the opposing robot in a battle. Pushing and ramming is also allowed when 17 teams from Germany, the Netherlands, England and Belgium let their robots fight against each other during that weekend. This year, Radio Controlled Tractor Pulling e.V. (RCTP) presents itself in the outdoor area between the halls 4 and 7 for the first time. The umbrella organisation for the so-called “Micro pulling” – the modelmaking variant of Tractor pulling – unites members from all over Germany who are interested in strength sports in modelmaking. In this event, model tractors with a combustion or electric motor must pull a brake van weighing up to 25 kilogrammes. The tractor that pulls the brake van furthest wins the heat. The run is twelve meter long and consists of clay. Every tractor is a self-made unicum with up to eight cylinders in the engine. Therefore, a lot of noise is inevitable when the models compete against each other in nine different categories in championship runs at the weekend of the exhibition. In this segment, the German elite is complemented by guests from Denmark and the Netherlands. On the first two days of the exhibition, the organisation introduces itself by presenting its unusual sport and some demonstrations. For the first time in many years, the national title bouts of the Deutscher Minicar Club e.V. 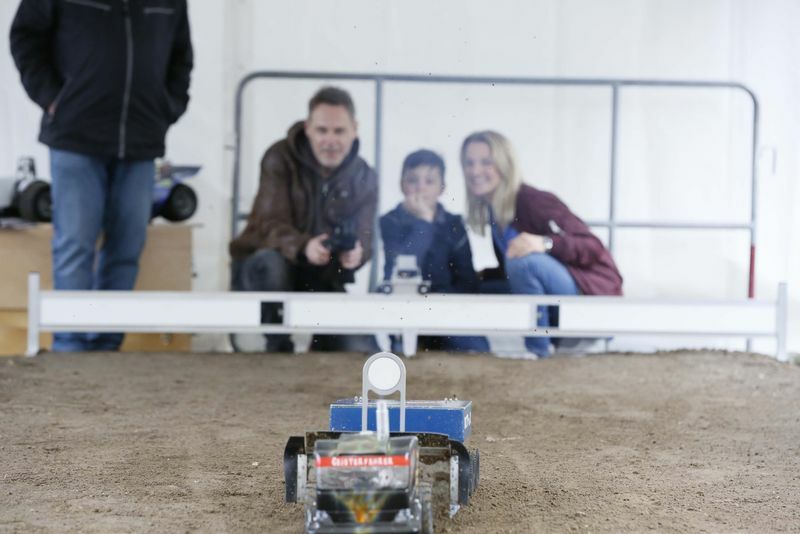 (DMC) – the umbrella organisation for remote-controlled car model racing in Germany – is fought on the smallest scale in front of a large audience at INTERMODELLBAU. Designed by Markus Mobers, one of Germany’s most successful RC car drivers, on a generous area of 20 x 30 metres in hall 2, the speedy and demanding course provides the best prerequisites for exciting title bouts to the national elite in the electric flat track categories EA (1:12 expert) and EB (1:12 standard) as well as in the guest category 1:12 GT. 60 of the best racing drivers in total will compete against each other. A flat wooden floor is laid for the race track; a carpet known from the Euro Touring Series (ETS) is used as the course surface. Via live timing and video stream, DMC and MC Dortmund (Minicar Club Dortmund e. V.) provide the RC car scene with the latest results and pictures of the German championship, which is rich in tradition and has been held year after year since 1980. 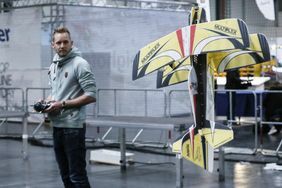 Furthermore, a race of the RC mini series takes place in hall 2 on the opening day of INTERMODELLBAU. During the entire exhibition, racing drivers of the next generation can also race cars along the join-in course of the DMC and experience race feeling in hall 3. On its stand, the DMC provides visitors with information on racing events, championships, local clubs and memberships. In addition to action-packed races, numerous exhibits of classic cars, starter models and racing cars are presented in hall 3. The show of the Roadworker in hall 6 provides for adrenalin and thrills. Renowned manufacturers from the RC functional model construction sector teamed up and present a show called “Build it! – An ordinary day at the construction site” with smoke and pyrotechnics and demonstrate the power of remote-controlled diggers, tippers, dumpers and tractors. The models climb ramps, move piles of earth and extinguish fires. After every show, modelmaking experts from the functional model construction sector provide their expertise on paint, lighting and batteries in a panel discussion. In hall 8, things are literally gigantic. Every two hours, the syndicate of model giants consisting of experts for remote-controlled large vehicles present more than 40 of its models on a scale of 1:8. On a course with an area of approximately 711 square metres, lorries, diggers, trucks and agricultural vehicles that weigh up to 150 kilogrammes and are up to 2.50 metres in size are presented in a realistic looking landscape with roads, bridges and houses. This year, the area which is planned exclusively for the exhibition three months in advance is complemented by a bridge with a length of 10 metres and a bearing capacity of 600 kilogrammes. The models are electrically driven and some of them have installed hydraulics working with up to 50 bar. Anyone who wants to experience the course of the model giants at close quarters is invited to a ride with Dampfmodellbau-Freunde, the fans of steam engine model construction. In hall 8, their course is lead through the miniature landscape. This is not just a highlight for young visitors: The steam model railway also effortlessly carries a large group of adults. With a comprehensive special exhibition, daily air shows and experts at the stands, fans of flight models get their money’s worth in hall 3. Large-size exhibits show the entire range of the flight model sport. Zeppelins, helicopters and charter pilots are presented here. Among others, Phantasy in Blue, a Dutch foundation with the aim of recreating all aircrafts of the Dutch air force and the KLM, participate with their models. Every year, live presentations of flight and helicopter models traditionally are a true visitor magnet for which an indoor arena with its own stand was established in hall 3. The pros let their models fly to the rhythm of the music or show aerobatics with flags and stripes. This year, the best European indoor team participates. The line-up of pilots is impressive: Besides Markus Zolitsch who won several German championships in indoor aerobatics, Derk van der Vecht, multiple Dutch Champion, and Martin Münster, Germany’s youngest show pilot, participate. 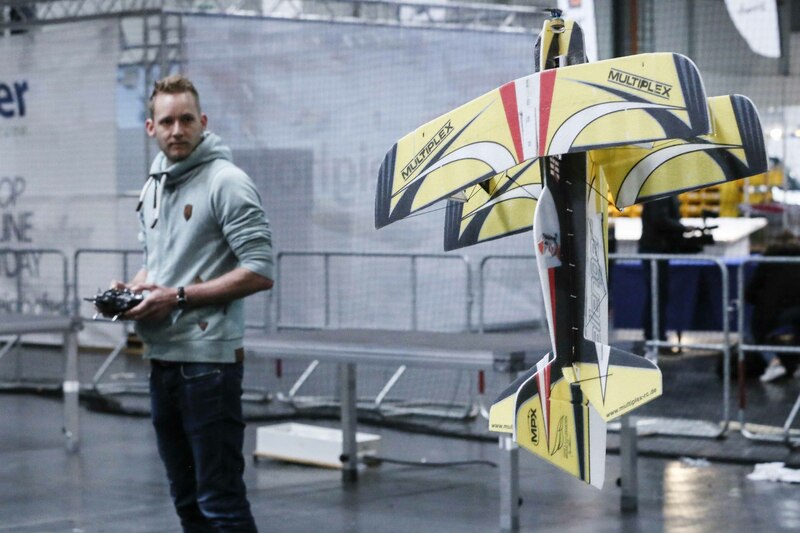 Top-notch Indoor flights, extreme manoeuvres, synchronous flights and freestyle flights are shown. 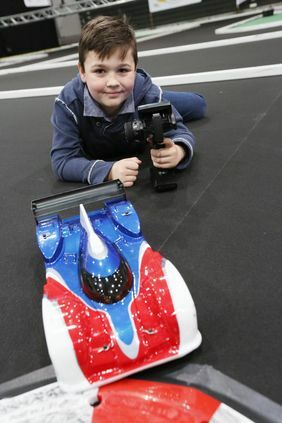 Special highlights such as a “Star Wars Podracer” or Molly the flying locomotive are flown through the exhibition hall. At the weekend of the exhibition, Frieder Bodem and Johannes Althoff, pilots of the next generation, demonstrate their skills with two double deckers of the type Challenger. Drones and multicopters regularly raise questions concerning current rules and laws. In order to bring light into the darkness, various experts from the flight model construction sector answer questions about laws and insurances at the stand of the Deutscher Modellflieger-Verband e.V. (DMFV) on Friday. At the exhibition, members of the DMFV possessing a sound lever meter which measures the noise level that must be observed during the flight can have their device calibrated for free. The measurement is done in a few minutes. Afterwards, the tested devices are provided with an inspection tag. The stand of the DMFV will be fun for young visitors as they can acquire first knowledge in the area of aerodynamics together with experienced model makers and build their own small flight models. 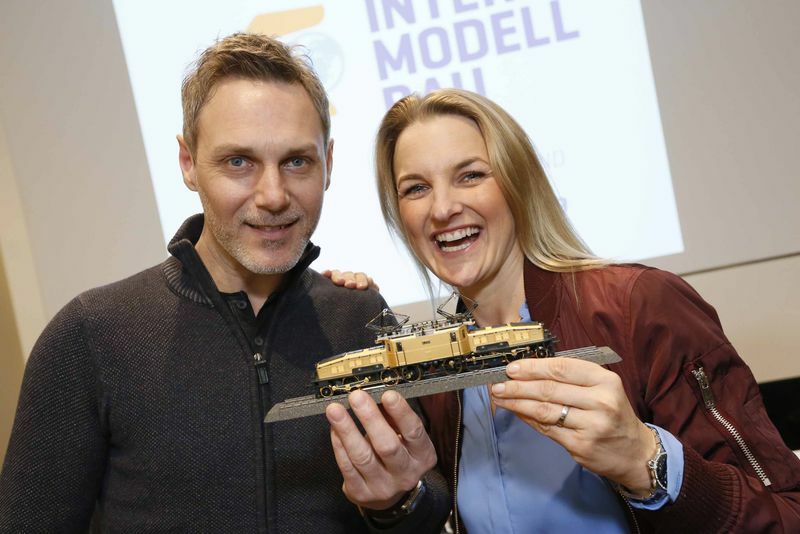 Almost every large-scale producer of model railways, several small-volume manufacturers, publishers and dealers come together at INTERMODELLBAU 2019. In the halls 4 and 7, fans of model railways can buy trains, construction sets, accessories and tools to their heart’s content or get inspired. Interesting exhibits can be marvelled at. At the stand of Rainer Tielke and Torsten Schubert, for example, the model of the Shinkansen 500 “Hello Kitty” that was created after the Japanese model is presented. At the stand of Märklin, a traditional exhibitor, interesting models can be marvelled at. The authentic replica of the heavy goods train and electric locomotive “Krokodil” of the Swiss Federal Railways (SBB) is a particularly shiny model as the locomotive stems, wheels, road parts, some attachment parts as well as the middle part of the locomotive are coated with 24 carat fine gold. For the 100th birthday of the legendary electric locomotive, the model is issued in a one-time series. Only 3,500 locomotives will be available worldwide. At INTERMODELLBAU, there are many new products of the current season that are presented to the public for the first time including over 30 display installations with more than a dozen German premieres. They include all common track widths from Z (1:220) to 1 (1:32) and are selected with a high quality standard by the Modellbahnverband in Deutschland (MOBA). Several model railway clubs, syndicates and private individuals from the Ruhr area participate, such as the Interessengemeinschaft Essen, Dietmar Allekotte of Mühlheim or the Verein Furka-Bergstrecke, section North Rhine-Westphalia, of Dortmund. Display installations from five different countries – Germany, Great Britain, France, Belgium and the Netherlands – are presented in total. One of this year’s highlights is the model railway Saint-Tourbière of Wim Wijnhoud from the Netherlands celebrating its German premiere at INTERMODELLBAU. It takes place in the 1980s in the Auvergne-Rhône-Alpes region of the southeast of France and takes the visitors back to another time. The installation “Purgatory Peak” of the English Macclesfield Model Railway Group in track 0 at the scale of 1:48 is another highlight. It takes place in the San Juan Mountains in Colorado. Although the vast majority of the trains show what the Denver and Rio Grande Western Railroad used as rolling material, other engines of fictional railways of wood and mining companies also ride on the track. In model railway installations, the topic of digitalisation has been important for a long time. However, the industry is constantly evolving. At the new action area in hall 4, exhibitors such as Viessmann, Zimo or Lenz Elektronik therefore tell interested visitors in MOBA seminars everything about digital market innovations and apps and give advice on controlling, shifting and signalling. In addition to the presentation of product trends and important practical tips, there is also a play corner for young visitors at the action area. 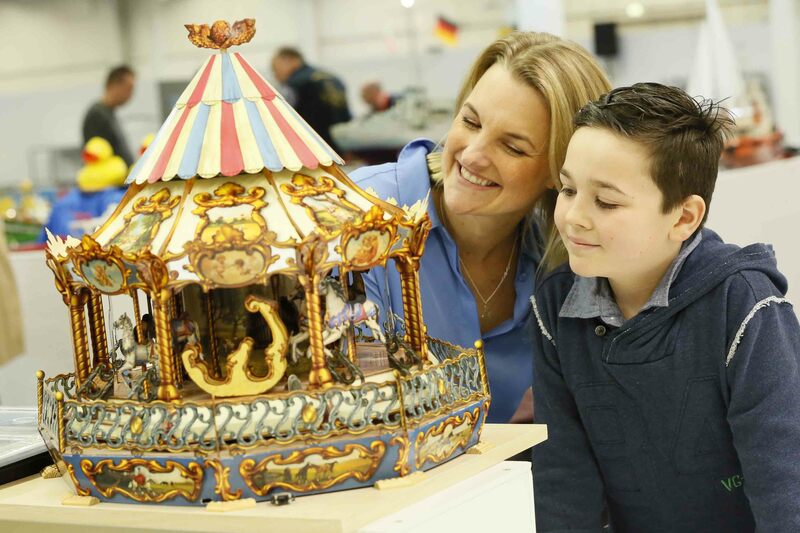 Furthermore, model makers of the next generation get an insight into the fascinating world of model railways at Junior College Europa (JCE) of the Bundesverband Deutscher Eisenbahn-Freunde (BDEF) in hall 7. From the very start, model ships in all sizes and variants are an integral element of the exhibition. Numerous international clubs present their diverse model ships in a water basin with an area of more than 500 square metres. For that reason, around 25 model makers participate in INTERMODELLBAU with one or several models. You can see, among others, two rescue cruisers at a scale of 1:15 that weigh 70 kilogrammes and have special effects such as a foghorn or a fire-extinguishing water cannon. Even exhibitors from Russia made the long journey to present their latest models at INTERMODELLBAU. They bring around 20 prototypical model ships such as the battleship “Tsar Aleksandr III”. The ship of the line “Imperator Aleksandr III” of the Russian Imperial Navy serves as a model. The battleship “Tsarina Maria” is another model which is based on “Imperatritsa Mariya” of the Russian Imperial Navy. So, model ships that are rarely seen in Europe are presented in Dortmund this year. The young generation works meticulously, among others, at the stand of the Berufskolleg Neandertal that participates in INTERMODELLBAU for the fifth time. Among other things, students work live on a cargo ship. They also bring their famous Titanic (scale 1:100) that was jointly built by the students and launched for the first time five years ago at INTERMODELLBAU – since then, it has been a true highlight. A highlight for all children: Small boats that are driven by air from a balloon can be built at the stand of nauticus e.V., the German umbrella organisation for model ship construction. Afterwards, the seaworthiness of the models is tested by the proud builders in the water basin. Children who would like to keep up with the adults can also learn how to control a model ship correctly on the large water basin and then acquire their “captain’s licence”. With the new WebApp for INTERMODELLBAU, visitors can obtain up-to-date and comprehensive information. A list of exhibitors, offers and brands as well as interactive hall plans and the framework programme are available at webapp.intermodellbau.de without downloading an app. With its framework programme and hands-on activities, INTERMODELLBAU is suitable for the entire family. Therefore, Messe Dortmund offers a reduced family ticket for €24.50. This includes admission for two adults with up to three children up to and including 13 years of age to the largest exhibition for modelmaking and model sport. In 2019, visitors can enter INTERMODELLBAU at several entrances. Besides the West and North entrance, the entrance at hall 3 is open as well. The venue overview as well as other important travel information are available under “Your Exhibition Visit” on the website of the exhibition.  Thu – Sat: 9 a.m. – 6 p.m.
 Sun: 9 a.m. – 5 p.m.
 nauticus e.V. – Deutscher Dachverband für Schiffsmodellbau und Schiffsmodellsport e. V.